Lots of interesting stuff going on in this research but to draw your attention to two in particular one is instrumentalizing “flows” as co-operations, and than foreshadowing how things are in/multi-stable not because they ‘withdraw’ per say but because they are among other things re-context-ualizable and contested, are “leaky” to repeat differently a theme I’m pearling along hereabouts. via The Fourfold and the Framework: Heidegger’s Topological Critique of Technology | Jeff Malpas – Academia.edu. In Hyperobjects: Philosophy and Ecology after the End of the World (University of Minnesota Press, 2013), Timothy Morton offers a way of thinking with and about hyperobjects, particular kinds of things of which we see only pieces at any given moment. (Though by the end of the book, Morton invites us to consider that perhaps every object is a hyperobject.) Hyperobjects have a number of qualities in common, and the first half of Morton’s book introduces and explores them: they stick to other beings, and they potentially transform our taken-for-granted notions of time, space, locality, causality, and the possibility of ever being “away.” How this all happens is explained in a wonderfully personal and engaging narrative voice that ranges from Heidegger to The Lord of the Rings to the Tardis to Op Art, and the second half of the book introduces some of the consequences of and opportunities created by thinking with hyperobjects. It is about global warming and intimacy and object-oriented ontology and modern art and the possibilities of a phenomenology after we get rid of any notion of “the world” as something out-there and beyond-us. For those who are interested in STS and its environs, it offers a very different and very thoughtful language for articulating narratives beyond a simple “object agency” frame or a human/object binary. It’s also a great pleasure to read. Although it is still useful to insist on the distinction between science and politics, the scale and importance of ecological mutations make it more and more difficult to use it effectively. The problem is that the alternative requires a redefinition of the two terms “science” and “politics”. The lecture will explore in which way an alternative definition could help us to cope with the geopolitical debates that will become more and more intense in the future. 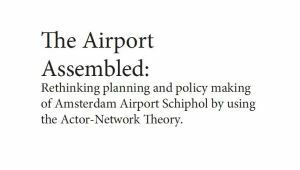 Cool new book on airport infrastructure from an STS approach now available freely on-line. You are currently browsing the ANTHEM blog archives for February, 2014.